Halloween time again. An excuse to dig out the facepaints and get your goth on, or to hide indoors munching a large slice of pumpkin pie. The choice is yours (Mmm… pie). What are your options this year for spooky revels? 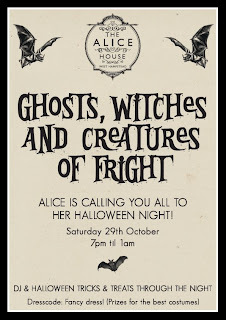 Surprise surprise, The Gallery and The Alice House once again lead the way with their Halloween parties. 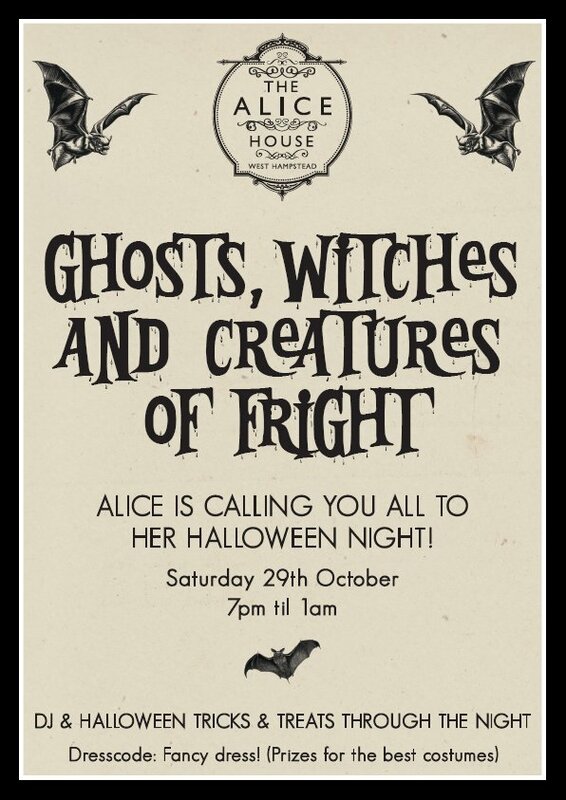 The Alice House’s kicks off at 7pm on Saturday and runs through to 1am with a DJ. There are prizes for the best costumes (1st prize – dinner for two, 2nd prize – bottle of bubbly [does that mean not champagne? ], and the best dressed group wins a round of shots). Over at The Gallery, well, it’s much the same. No DJ, but the bar’s open until 2am, which is confusing because the clocks go back at 2am on Sunday morning, so does that mean an extra hour of drinking? 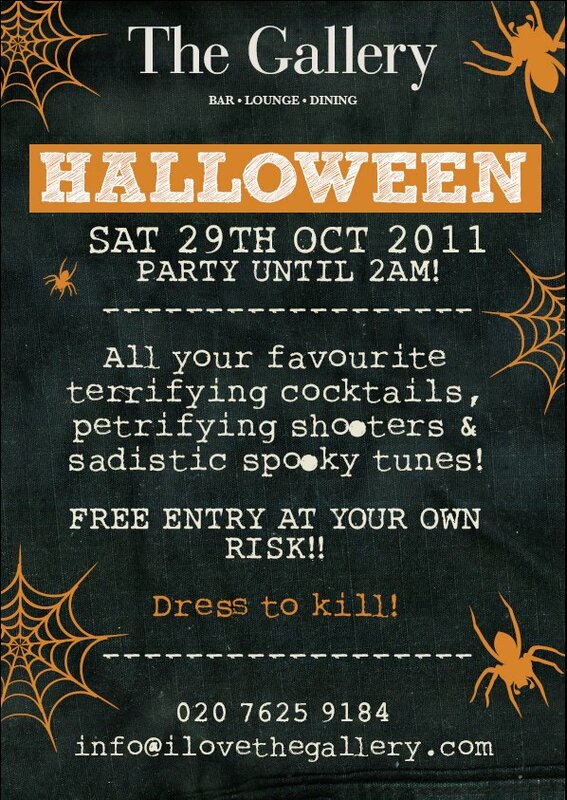 Fancy dress is still encouraged (although when I walked past last year, most people seemed to just be wearing black). 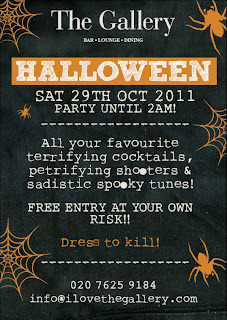 Over in Kilburn, the North London Tavern has a Halloween Horror night finishing at 1am. Prizes for the best dressed, ghostly drinks specials all night, and apparently tricks and treats! The Railway is your Halloween antidote – it’s decided not to do anything special this year, so if you want to escape the slime-coloured shots and zombie-clad wannabes, this is the place for you on Saturday night. The Good Ship prides itself on not overly pandering to or exploiting Hallmark holidays, but it likes to give a nod to Halloween, so on Saturday night, there’s an evening of Halloween fun with a spooky short film and then four live acts from 8-11.30pm and of course DJs until 4am. It won’t have escaped your notice that all this is happening on Saturday, which is NOT the 31st. Halloween itself is on Monday night and where better to spend it than laughing your little vampire socks off at The Good Ship comedy club, where host Ghouliet Stephens (don’t blame her for that, I came up with it all by myself) will be introducing a top night of comedy headlined by the outstanding Pappy’s (if you’ve not seen them, now’s your chance), and she’s claiming there might be pumpkin pie. Have a fun weekend everyone – look out for our three local spooky tweeters @ghostontoast, @Ghoul_of_London and the deliciously strange @MarmiteGhost. 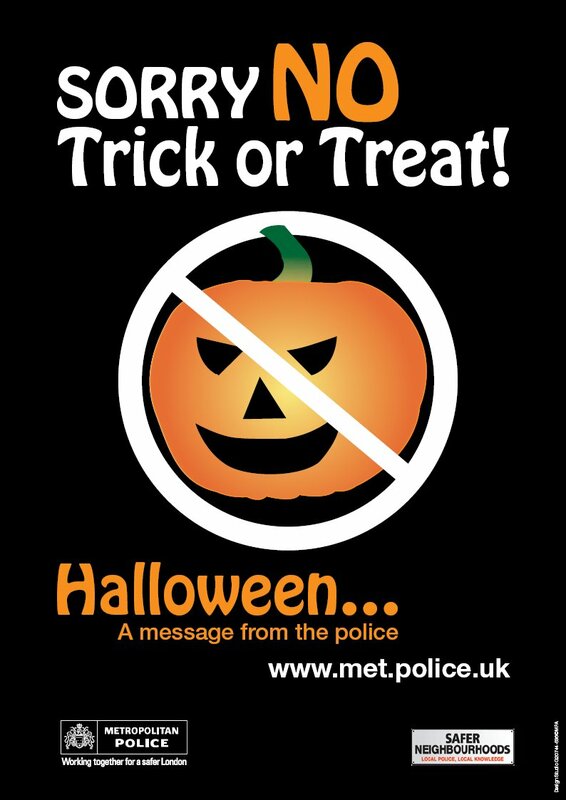 And if you think it will make any difference whatsoever, here’s a poster the West Hampstead Safer Neighbourhood Team have circulated for those who aren’t in the Trick or Treat mood. Life in the slow lane What have I missed since October 24th?